It was first described as a distinctive syndrome by Hinchey in 1996. Sporadic disease seen in children and adults. Dominant finding is seizures (90%) which are usually tonic-clonic. Status epilepticus. Symptoms come on over 12-48 hours and resolve within a week, sometimes a little longer. Hypertension is common but may be secondary to PRES rather than a cause. CT: is only helpful in half the cases. 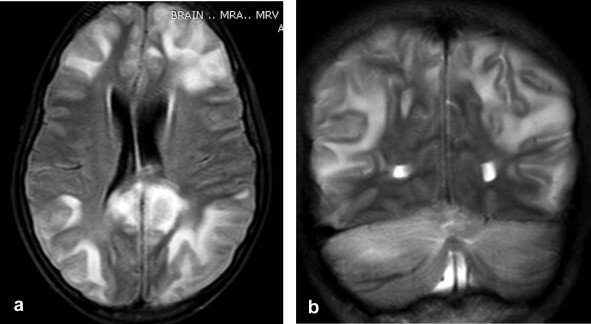 MRI: diagnosis is confirmed on MRI scan with the presence of bilateral vasogenic oedema with hyperintensities on FLAIR predominantly in the parietal/occipital region but sometimes in frontal lobes, temporoccipital and cerebellum [Barynski WS 2008].Extensive lesions on T2 weighted imaging tend to have a worse prognosis [Covarrubias DJ et al. 2002]. The lesions are due to vasogenic oedema and there is not usually restricted diffusion but in some cases DWI changes with restricted diffusion are seen. All of these changes should resolve with time. EEG is non-specific with diffuse slowing or focal δ waves. Infection Treat Sepsis syndrome. Abnormal LFTs, Renal function, Multiorgan failure. Infective encephalitis or meningitis, particularly herpes simplex encephalitis (Figure 3), should be considered, and rapid treatment with IV Aciclovir and antibiotics may be lifesaving while a diagnosis is still being pursued. Basilar artery thrombosis can present with progressive neurologic deficits and can result in tetraparesis, coma, or locked-in syndrome. Central nervous system vasculitis can mimic PRES but the MRI findings are usually more diffuse and irreversible. As the name implies there is reversibility. Haemorrhage is possible. Recovery usually happens over several weeks. Repeat MRI after 10 days should show improvement. Blood pressure may be a primary or secondary phenomenon but BP control is advocated but not with nitroglycerin due to negative reports. Seizures seem to burn out and so long term AEDs not needed. Recovery is the rule and outcomes excellent but this ultimate prognosis depends on the underlying cause.